Over the weekend I decided to update the MythTV VLC plugin that I wrote a while ago. The plugin allows you to watch your MythTV recordings in VLC without SMB or any other intermediaries. It talks the Myth Protocol. It’s now updated for VLC 1.1.5 and MythTV 0.23/0.24 and better than ever. It’s still a beta release though, so expect bugs. Some bugs which I’ve already noticed are occasional high CPU (after seek) and occasional crash when stopping playing. Other than that, it’s perfectly usable. This version adds preview pics for your recordings in the VLC media browser. The source code will be released soon on my github. This entry was posted in mythtv-vlc and tagged mythtv, vlc on November 28, 2010 by Loune. To install it, just extract the zip and move libaccess_myth_plugin.dll to your VLC/plugins directory. This was built against VLC 0.9.8a, so you should use that. 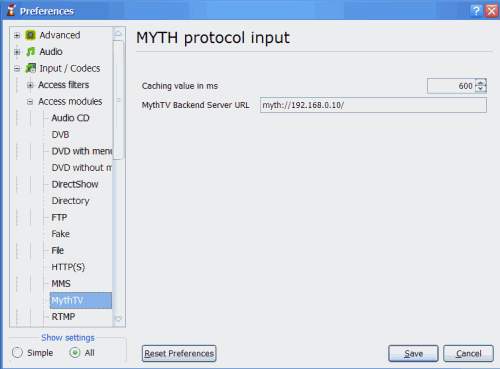 It only supports myth protocol 40 (so only works with mythTV 0.21) at the moment. After saving the settings, click the menu Playlist > Additional Sources > Myth TV library. Then open the Playlist (Playlist > Show playlist) and you should see a MythTV option on the left. Click that and all your shows should be there. This entry was posted in mythtv-vlc and tagged mythtv, vlc on December 30, 2008 by Loune.